I was hoping i can go out of town last Holy week but since my friends have no plans of having a vacation,i have no choice but stay home na lng..it was still a rather busy week for me though..
i helped my friend yogi polish Jesus Christ Superstar (a musical),our parish Lenten presentation for Holy Monday and Tuesday.However,due to inevitable happenings (the stage was set up late,the lights have not been designed by 7pm and people were already coming in),we decided to postpone the show that night. the show was a huge success last Tuesday and had a re-run last Wednesday..orchids to the cast and staff of the show! 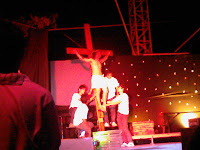 Ive been doing the stations of the cross for 10 years now,visiting different chuches for every station. i can still remember how hard it was going thru every station the first time, because we went to visit all the churches by walking only. (the only ride we had was from san jose agudo going to blumentritt) so its like walking from 5th ave to carriedo-stretched some more! last thursday visit wasnt really that tiring though..i must have been used to walking these paths every year..well,call it a little sacrifice..
Black Saturday- the traditionally held 10pm Easter Vigil Mass in our parish started earlier at 9pm so i wasnt able to see the blessing of fire and didnt hear the earlier readings.the salubong procession was also an hour earlier.. I was in Angie's party on Easter Sunday, together with my other colleagues in MUKHA AD ..after a week of reflection and quiet moments,it was great to have a lil party as Christ has already risen..
i wasnt able to push thru with my vacation plans-but it was perfectly ok still! for all the trials and tribulations i had the past year,it was a perfect time to ponder on things,give thanks and repent..